Looking for an easy but satisfying dish to serve up the whole family will enjoy? 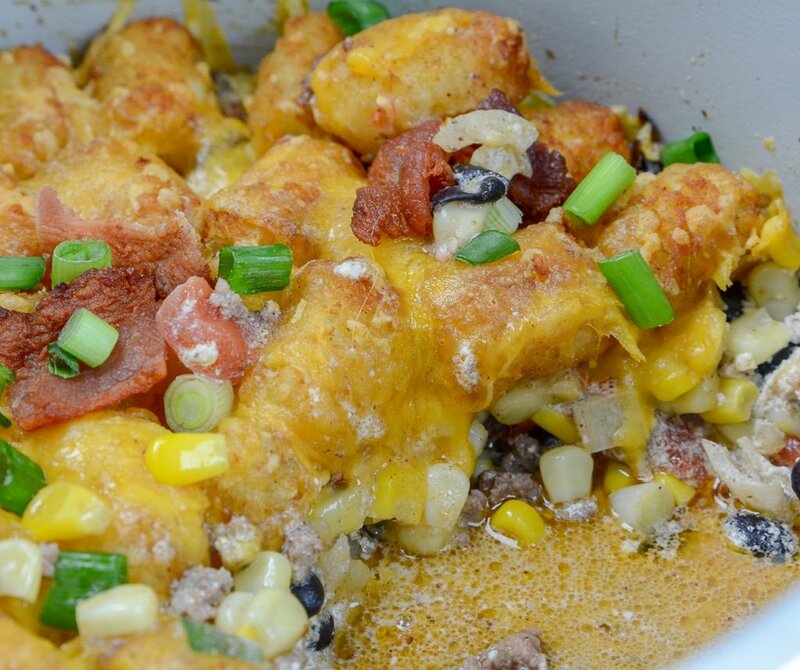 Cowboy Casserole in the Ninja Foodi or oven is the winning dish to try. 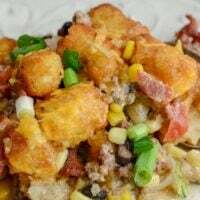 Tender ground beef, cheese, corn, and more topped with crispy tater tots. If you are a meat and potato person this recipe is right up your alley. 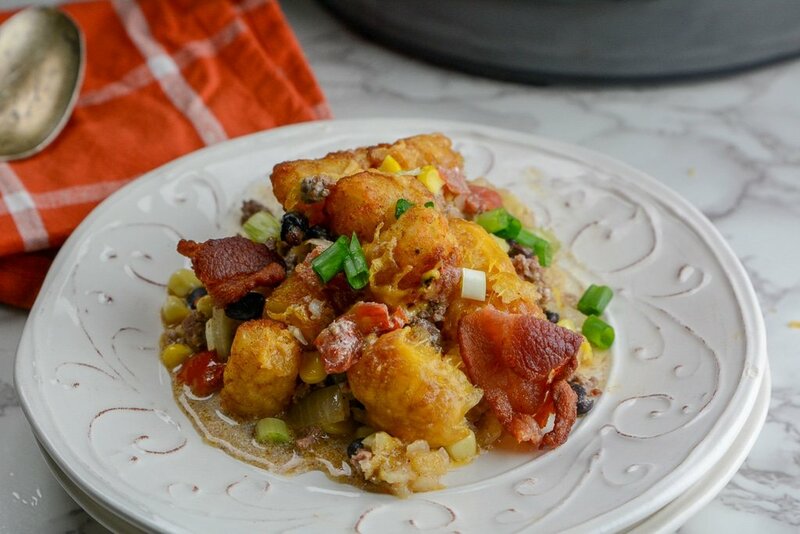 We grew up eating traditional tater tot casserole, this Cowboy casserole is an upgraded version. The Ninja Foodi was the perfect device to use for this recipe. It became a one-pot dish. 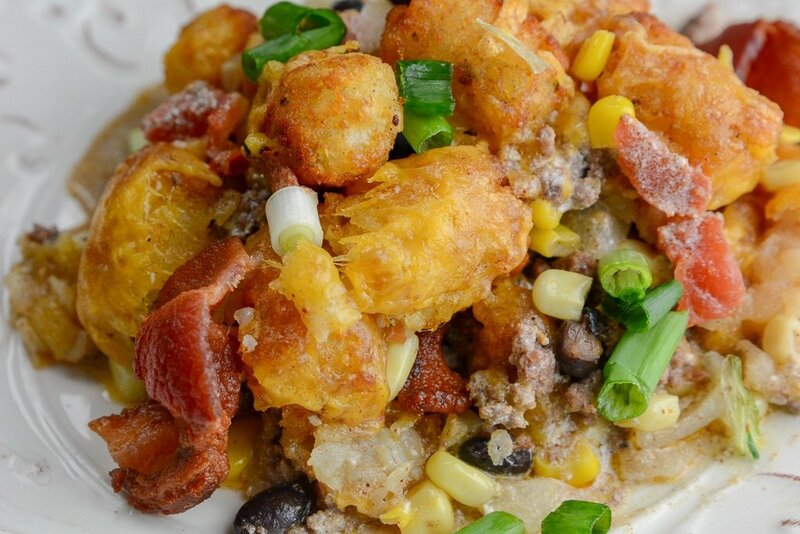 Cook your met in the Foodi, create the filling, top with tater tots, and start cooking. Minimal prep, little mess, and one savory dinner that everyone will love and enjoy. Best of all even the picky little eaters normally dive right in. If you are looking for a lighter version you could swap south ground turkey or even chicken. You might just need to add a little oil to pot when you cook the meat to prevent it from sticking to bottom since it’s a lower fat threshold. Yes! You totally cook. What I would do in this instance is to cook your filling as directed. Then transfer to a baking dish. Then top with your frozen tater tots, and then seal up tight and place in freezer. Then when ready to heat and eat then oven to 350 degrees and bake for 30-40 minutes covered and then the last leg uncover the pan. Then finish cooking until cooked through and tots are crispy. You will want to eat up any leftovers within 3 days. After that, you need to toss out any leftovers. 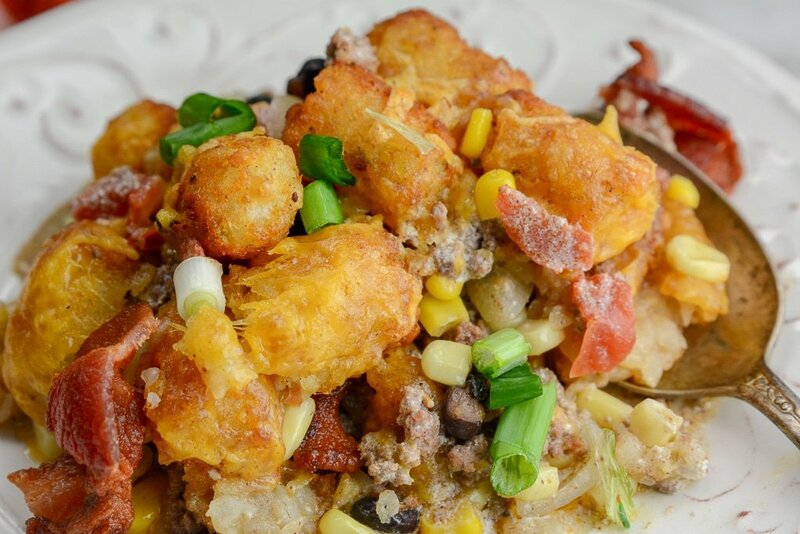 Cowboy Casserole can be a dinner in one! But if you want a little something extra maybe reach for a crisp side salad to lighten up the dinner. The casserole has potatoes and corn already but if you want more veggies maybe do a broccoli or cauliflower side. If you are like most your juggling the balance on home life, chores, chasing kids, and work. Having a casserole that comes together quickly with minimal effort is a must. Saves you from having to order takeout and it’s a meal the whole family can enjoy. Plus leftovers reheat nicely so that’s always a mom win! 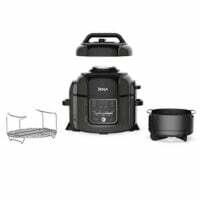 cowboy casserole in the Ninja Foodi or oven is the winning dish to try. 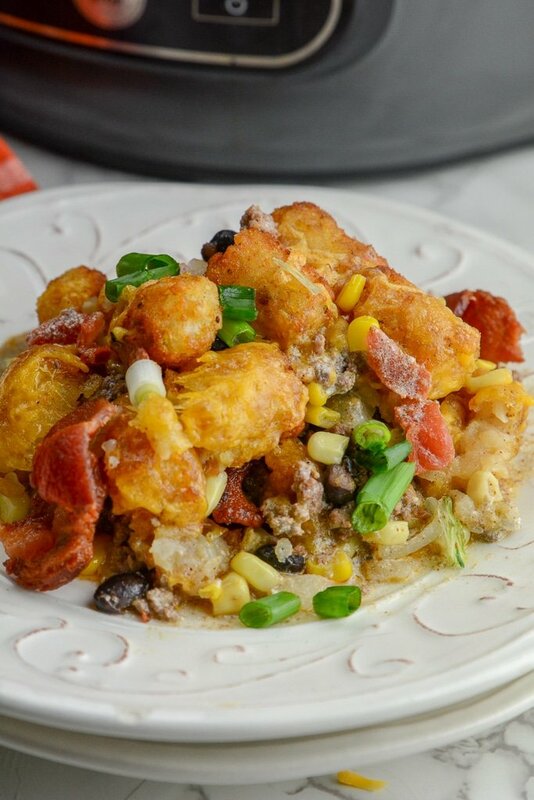 Tender ground beef, cheese, corn, and more topped with crispy tater tots. Remove lid and place cheese on top Continue cooking for an additional 5 minutes. Top with cooked bacon and green onions. Cook as above in a regular pan saute your meat as above. bake in a casserole dish oven on 350 for 45 minutes or until tator tots are golden brown. Top with cheese and continue cooking for 5 minutes until melted. Making this on Thursday. It will be my very first time using our Ninja Foodi. I’m so excited to try this. Holy cow this is GOOD!! This was my first time cooking in my new Ninja Foodi. This was so easy, and very filling as meal by itself (and we did the recommended serving of 1/6. Thank you for sharing this super delicious recipe. Does this have a ceramic pot? If not, what is the model # for that one?